This profile represents the event we attended, to run a special and private video game tournament put on by Massive Inc.! Massive Inc. is a Microsoft Advertising company that develops advertising campaigns WITHIN video games. They invited some of their top ad agencies to come enjoy a night of plastic rock and roll and we were hired to make the gaming tournament run efficiently and to let the Massive folks further connect with their clients at this unique and energized evening of music! 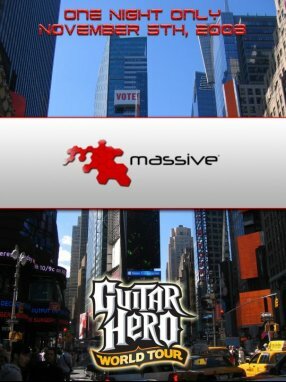 The format for the tournament was that each of Massive's ad agencies that had been invited, was represented by a band (and fans), who competed in a 1v1, single-elimination Guitar Hero: World Tour tournament. We got the Hudson Terrace venue for this awesome event, which is located near Times Square and was a perfect place for this big event. Competing teams squared off and performed against other bands as they competed to win many prizes, including the Grand Prize of a awesome real guitar signed by the entire Aerosmith band! All band members played on Hard difficulty for the two guitars and Medium difficulty for the new Guitar Hero elements of Vocals and Drums. Although their final score was important, our celebrity judges handing out the infamous "Style Bonus". Members from Run DMC made up our judges panel, so along with some spinning that DJ Johnny Juice did during our intermission, these guys offered some fun and insightful remarks on the performances and were a big crowd pleaser! Members from our team will be the same Plastic Rockstars that attended and ran the Brocade event at Microsoft's Tech-Ed 2008. These guys include RyuBlitz, codeh4x0r, and BEN. We managed the game setup, band transitions, and tournament management throughout the evening. Ryulitz managed the technical aspects of the main stage, codeh4x0r ran the exhibition gaming stations, while BEN will be networking, helping RyuBlitz, and MCing the event with the overall event planner, Heather. Biily Joel - "Rebel Yell"